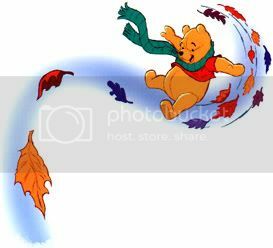 Yesterday was, as Winnie the Pooh would say, “a rather blustery day!” There I was on my morning speedwalk, getting blown about by wind and leaves, as the sky became intermittently cloudier, then sunny, then cloudy again, with the temperature quite brisk. It didn’t do much for my speed time, but I noticed my mood getting lighter and happier with every step. Why, you might wonder, would anyone in their right mind feel happier as the weather becomes more sultry and stormy? (Back Story): Over the years doing psychotherapy, I’ve noticed clients coming in on windy, grey, “bleak” days complaining about the unpredictable, “bad” weather in New England. Many of them are particularly sensitive to the loss of light as the winter approaches (“seasonal affective disorder”), and actually get more depressed in the winter months. When they try to get me to commiserate, I can’t hide my glee about the colder, dark, temperamental weather, attributing my comfort with it to my Russian heritage. Clients then look at me blankly, chuckle, and change the subject. My brother-in-law Joe says, “You New Englanders are always complaining about the weather! Move to Florida and have sunny weather every single day!” That would be a personal Hell for me. When I was in Italy I found that the only thing I didn’t like was the constant, sunny haze. It felt oppressive, and so would constant sunshine anywhere! Who said that a cold, dark day is “bad weather”? We all need to be careful about the subjective descriptors we give to neutral things, which then effect our moods. On a blustery day, think about all the choices you have: You can stay inside, get cozy and warm, and read a book, pay bills, play an instrument, or watch a movie. You can stay outdoors and do house projects and chores. You can get in the car and go for a scenic ride, hike in the woods, or go for a bike ride. You can do everything or nothing at all. In or out, there’s no pressure like the kind you feel on a “glorious” day to do “fabulous” things. So I’ll take a blustery day anytime, thank you.